Combat action at Chehalis Cup No. 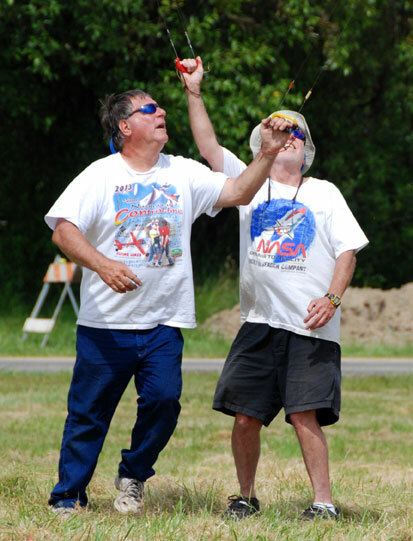 1: Bob Smith (left) and Buzz Wilson fly an F2D Fast match. Flying Lines photo. June 15, 2013, Chehalis, Wash. This is the fifth season for the C-Cup, which continues to evolve. 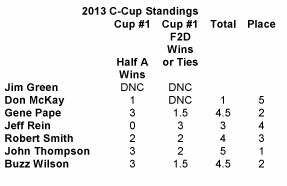 For the 2013 Season, 1/2-A Combat is being included in calculating points awarded for the C-Cup. In addition, one half points will be awarded for a tie. Prior to the start of 2013 C-Cup Contest No. 1, Jeff Rein, Robert Smith, Don McKay, and Buzz Wilson received their MACA T-Shirts for finishing in the 2012 Miniature Aircraft Combat Association Top Twenty. Six contestants flew Double Elimination High Performance 1/2-A. 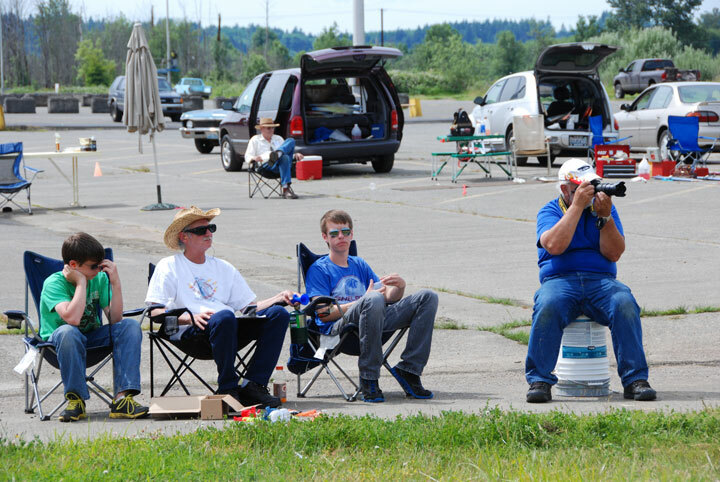 Planes were pull tested in the pits and streamers handed out. At the pilots meeting, the pilots agreed to a 15 second warning to the start of the match once the bladders were filled. At the five-minute mark, pilots had 30 seconds to start their engine and get them launched. If they were not airborne at the 4 minute 30 second mark, then they would incur ground time. One of the best matches of the day was between Robert Smith and Don McKay with Don winning. After two rounds, one competitor had been eliminated. At the end of the third round, there were four flyers still in the hunt each with a loss. In the end, John Thompson prevailed to win first. There were 12 matches flown. There was a mix of equipment being used. Most competitors were using Cyclons on Sonic Chickens. Robert Smith was using his rebuilt Profi and John Thompson was using a Fora. I did not see any GSUMP lines being used. 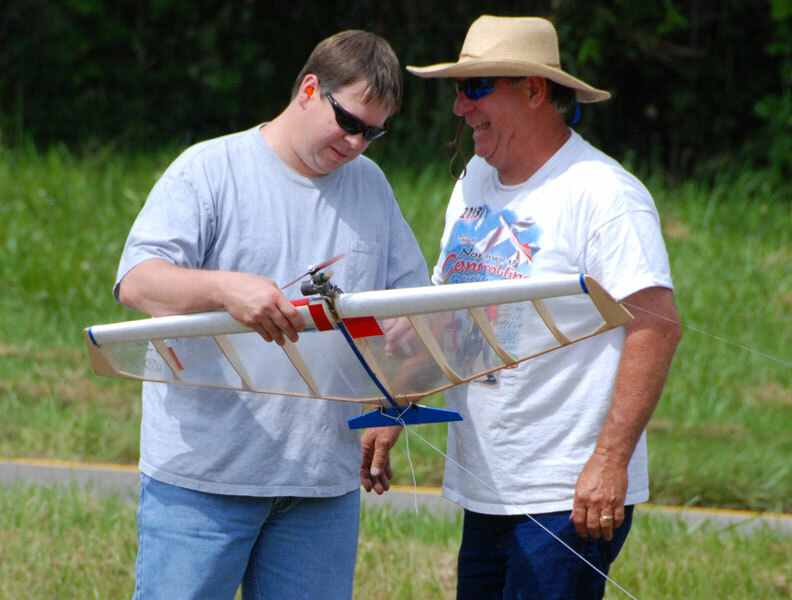 Duke Johnson did lunch to thank all the flyers who have been supporting his family's model airplane activities. Once again Daniel and Nathan provided young eyes to help judge. After lunch, we flew Speed Limit Combat, using the F2D Fast cuts-only version. With five flyers, we agreed to fly round robin; this meant there would be 10 matches. The first match was Jeff Rein flew Gene Pape with Jeff getting a cut and winning the match. Gene stayed on circle and flew Robert Smith winning with one cut. The next five matches were won by flyers with the least amount of ground time. John Thompson was the only flyer to get two cuts in a match. At the end of the day, Jeff Rein won Speed Limit. At the conclusion of the flying, awards were presented to the winners. Robert Smith, the 2011 C-Cup winner, handed over the cup to Buzz Wilson, the 2012 winner. Looks like Robert will have to find another water bowl for Rufus and Sparky. 6. Jeff Rein, Covington, Wash.
Chehalis Cup Contest No. 2 is scheduled for July 13 See Where the Action Is for details. 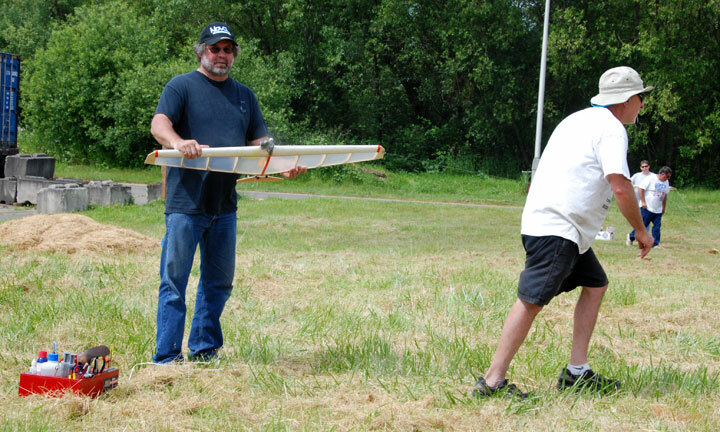 A match gets started: Buzz Wilson (foreground) and Bob Smith (background) head to the handle as John Knoppi (left) and Scott Johnson hold the F2D Fast planes. Flying Lines photo. Scott "Duke" Johnson (left) and Bob Smith share a laugh before a match. Flying Lines photo. On the sidelines: Gene Pape (right) takes a photo while official Jeff Rein (white shirt) conducts a match with the help of judges Nathan (left) and Daniel Johnson. Flying Lines photo.